N/C: Tell us a bit about yourself - The weirder the better! GLENNO: I'm no weirder than the average person - so file that under ‘secretly’ weird. I suppose it's weird to draw for a living or make any coin from being a creative type without being part of a massive media conglomeration. I also think it's unusual that I'd spend half my days for 3 months curating events and herding cats for no money and no guarantee it won’t actually cost me to do it. I'll tell you, now that i've thought about it, I am weird... but weird is worthwhile. What drew you to initiate the very first Bein’ Narly show? Any memorable moments go down that night? The first Bein' Narly was a simple group show in 2016 at the awesome Alpha Gallery. We had Pterodactyl man there doing haikus at people. The Saturday saw the Reverend Kriss Hades destroy his gear and our eardrums with noise. The show had potential to become a bigger thing, bigger than just a pun or annoyance to the Sydney biennale. It has certainly proved that as we enter the last 2 shows of this bi-annual festival's nine-shows-over-two-months roster. With each year I do these things, I get to meet some great artists and surprisingly incredible friends. It's also a party and parties are good for you. It’s a hard slog being the main man behind such a massive project. What has been the best bit/s of the process so far? Just the good feelings from artists and exhibition goers. Angie from Uno Duo has documented (brilliantly) each event and these videos say it all. Sponsors and artists (apart from a few flakey types that have cost me money and sleep) have all thrown in enthusiasm and talent and made my efforts feel/seem worthwhile. One day this behemoth may pay me a wage, but this is an event that this city needs, artists deserve and is a great start of better things to come. Pat Grant's comic launch was the best art event I've ever had anything to do with - him and Fionn are creating a comic that Netflix should crawl over hot coals to commission for a series. There’s one final show left for Bein’ Narly this year, ‘The Craft (and Art) of Beer’. Tell us a bit about the show! The last show is a themed show which celebrates the craft beer boom in this part of the city. Young Henrys have been a dedicated and enthusiastic sponsor and over time have been nothing less than supportive of art shows in this town. The show isn’t about that relationship as much as a love letter to beer in general. The art for this is killer - designed to be stared at through beer goggles. You are invited - Gallery 371 - Enmore Rd on Friday, April 20th until Sunday, April 22nd. 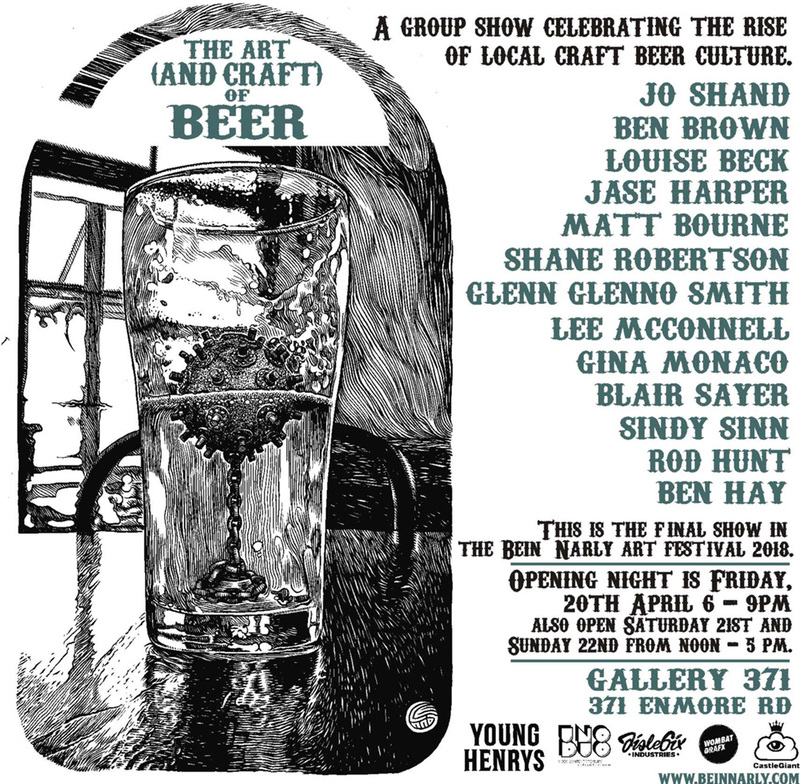 "The last show is a themed show which celebrates the craft beer boom in this part of the city. Young Henrys have been a dedicated and enthusiastic sponsor and over time have been nothing less than supportive of art shows in this town." What are your grand plans for next time’s Bein’ Narly? How can artists hop on board to join in the fun?